Ten years ago the only practical way to examine the back of an eye was to use an ophthalmoscope and the view you get, even with an extremely good ophthalmoscope, is very limited. Consequently your optometrist has to spend quite a lot of time looking very carefully into each eye and it’s a very skilled task simply being able to see what is there before you can start to work out if anything is going wrong. The image left shows what the back of an eye looks like through an ophthalmoscope – you can’t see very much at a time so your optometrist has to move around a lot and put it all together in his or her mind. In 2001 we bought our first digital Fundus Camera. Fundus Cameras take images of the back of an eye (the fundus oculi) and digital cameras store the images on a computer so we can look at them whenever we want. As they are digital images and don’t have to be sent away for processing we can see them straight away. The advantage of a camera over an ophthalmoscope is that you can keep looking for as long as you want without dazzling your patient and you’ve got a permanent record to compare the fine detail with next time round. You can also see a much wider area of the back of the eye at any one time. 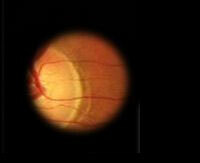 The image above is what the same eye looks like using a fundus camera. Our new camera not only takes better, more detailed images but also takes 128 individual scans of the back of the eye which are effectively cross-sections through the retina and show up the structures of the back of the eye in incredibly fine detail. 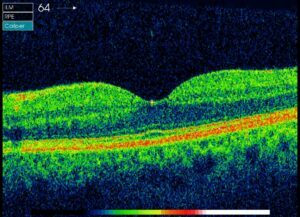 This particular scan is through the macula and shows very clearly how the nerve fibres at the top are angled away from the very central part to allow more light through to the photo-receptors underneath (at the top edge of the red band). 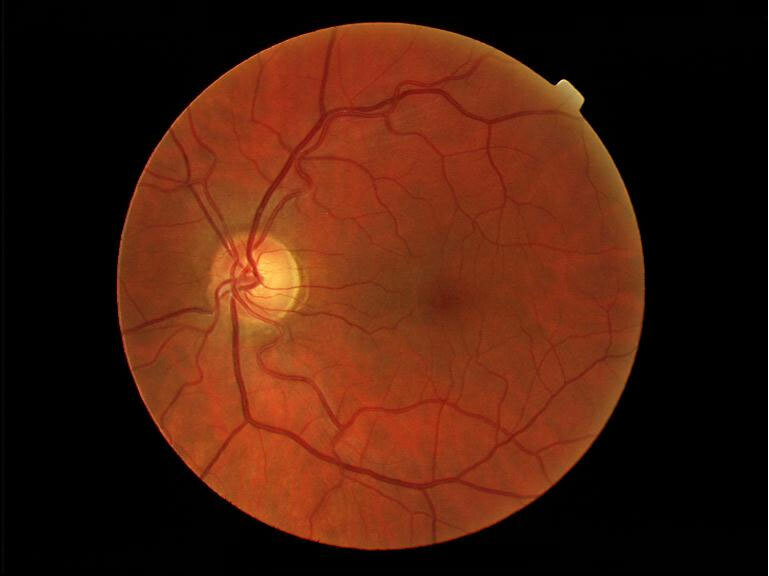 The overall thickness of the whole retina shown on this scan is just over half a millimetre. It can then put all 128 scans together to produce a three dimensional image of the retina which allows us to see and understand much better the very fine changes which can be the indications of something going wrong.